Indigenous peoples’ relationship with land and nature is intimately tied to their identities as distinct cultures with specific knowledge systems, spiritual beliefs and ways of life. For instance, Indigenous peoples recognize that bears play an important role in coastal ecosystems. 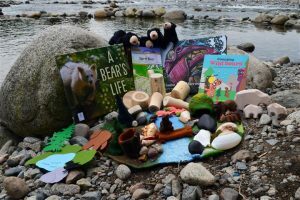 Currently this kit is not available through our lending library, but can be accessed through Westcoast Child Care Resource Centre, Victoria CCRR, and Kamloops CCRR until early September. Borrow materials from our resource centre, get discounts on our annual conference and more!